Born in Sudan in 1967, and presently living in Ottawa , Hamid Ayoub is a Bachelor of Arts graduate from the College of Fine and Applied Arts, Sudan University of Sciences and Technology, with a specialization in Textile Design. For him art, is ever present because we are surrounded by shapes and colours which are the pulse of any artistic creation. Every-day sights and situations shape the work of the artist. 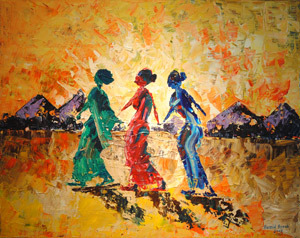 Hamid Ayoub depicts the emotions of human spirit through colour and movement. Different mediums are used to render the entire spectrum of life experiences. 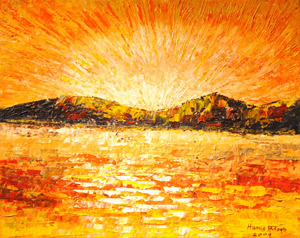 Hamid's work has been exhibited in many venues in Sudan, Niger, France, Holland, England, the United States and Canada.